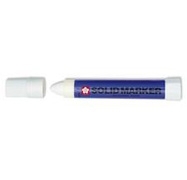 KARN Automotive Auto Dealer and Detail Supply - Paint Pens and Markers Solid Markers Solid Marker - White Permanent, easy to use solid paint marker. Works on most surfaces including metal and glass. Fade and water proof. Permanent, easy to use solid paint marker. Works on most surfaces including metal and glass. Fade and water proof.